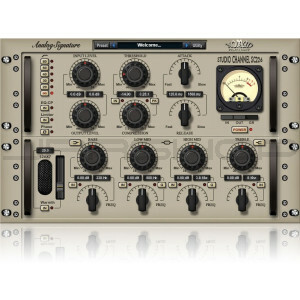 The Studio Channel SC-226 is a stereo channel recording plug-in, featuring four band equalizer, an analog "signature" optical compressor and at the heart of the shelving and bell filters, a tube simulator and Brick-Wall peak limiter designed to reproduce the warmth of vintage recordings with unrivaled quality and realism. The Studio Channel is tube style virtual equalizer / compressor. It is equally suited for delicate vocal as well as dynamic instrument recordings such as lead guitar, bass guitar, drums and horns. The algorithm was designed to emulate the response of a high-end vintage analog equalizer/compressor. Exceptional for tracking, mixing or mastering, the Studio Channel recreates the warm sound qualities of its analog hardware ancestors.